In May 2012 Porsche Engineering took over responsibility for the Nardò Technical Center in Apulia, South Italy. The testing center was founded in 1975 and is, today, one of the most important and famous proving grounds in the world. The characteristic feature of the Nardò Technical Center is its Circular Track, 12.6 kilometers long, 4 kilometers in diameter. Due to the inner inclination of the outermost track, the centrifugal force is compensated and it seems as if you are driving in a straight line, even at high speeds of 240 km/h. 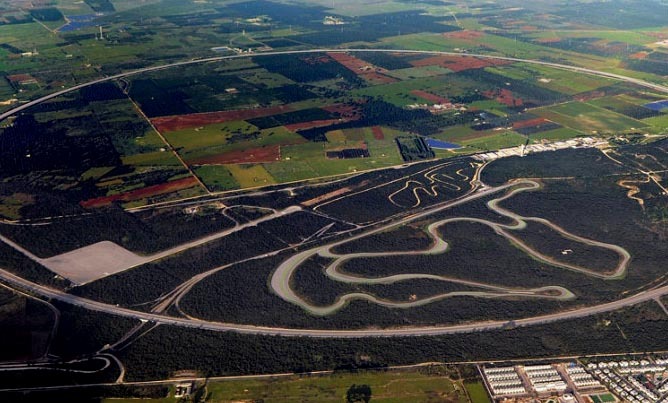 Besides the impressive ring track, Nardò Technical Center offers various test tracks and facilities. But, not only the vast range of test tracks und facilities make the Nardò Technical Center a milestone in automotive history. Another important advantage is the unique South Italian climate: thanks to the generally mild climate with only a few rainy days and hardly any frost, testing on the Nardò proving ground is possible 365 days a year. Porsche Engineering services provider inside the Porsche Group, has been offering engineering services at the highest level to all kind of clients of the automobile industry and beyond for more than 80 years now. With the addition of the testing facilities at the Nardò Technical Center, Porsche Engineering has extended its offer even further. Nardò Ring is not unique, but by far the largest. Similar test tracks with banked lanes exist elsewhere, such as the 5km Opel test track in Dudenhofen in Germany, and the 3.2 km Millbrook Proving Ground in U.K.
Few days ago Porsche Engineering and the Puglia Region have underwritten a deal and Porsche will invest 60 Millions Euros for improving the site with new tracks, a center of medical safety and a new heliport, but the most important thing will the 30% more employees and increase in the number of daily visitors in Nardo’ area from the automakers which are now about 400 units per day. For further information on Porsche Engineering please visit www.porsche-engineering.com.